All transactions are safe and secure with a reliable history in online purchasing behind each of our associates. Buy the Soft Kitty Hoodie With Ears and Tail t-shirt to own Big Bang Theory clothing and merchandise. 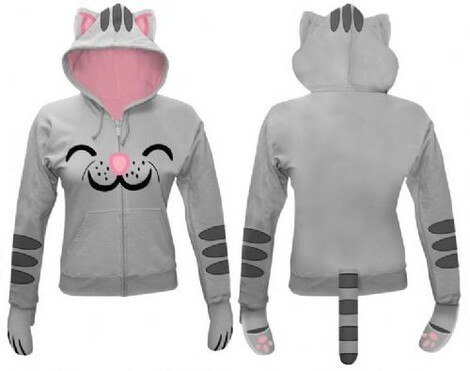 Here's your chance to literally be a "warm kitty" in this adorable BBT Soft Kitty hoodie with ears. Wear it as you sing Sheldon's "Soft Kitty" song from the BBT TV show, but be careful that you don't leave a "little ball of fur" in your wake. Put this hooded Soft Kitty sweatshirt on over your favorite Big Bang Theory tee, but don't be surprised if fellow fans try to pet you. It's the perfect addition to your BBT wardrobe. In addition to the Soft Kitty Hoodie With Ears and Tail tee above, browse the Big Bang Theory Clothing Gallery for more apparel like men's and women's clothes, kids shirts or hoodies.